Windows clipboard hasn’t changed much in 30 years. It’s still very limited. This fall, Windows clipboard will get a major makeover and it will finally get the features that have been available in clipboard managers for decades. But even when the Windows clipboard gets its much need renovation, it won’t have the functionality of this Cloudeight freeware pick. It’s probably the most intuitive and easiest to use clipboard manager we’ve ever used. Of course, there are dozens and dozens of clipboard managers and we’ve not tried them all. I can’t do anymore today; there are tony 24 hours in a day, you know. PinClipBoard does more than just let you copy & save text. You can also add pictures and folders as well. It’s a full-featured, easy-as-pie-to-use, free clipboard manager, that you’ll want to try. Here’s the developer. He wants to tell you all about this great free clipboard manager. Take it away! 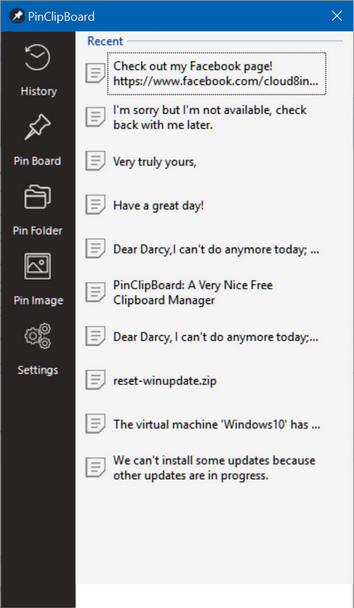 PinClipBoard is a handy clipboard manager software with advanced “Pin” and “Synchronize” features. Simply copy text and images to the clipboard by “Ctrl + C” and you will get a list of recently copied data. “ClipBoard History“: PinClipboard enables you to record the data history of the clipboard on your Windows system. Run the handy program and anything you copied will show up on the “History” window in a shockingly short time. “Pin Board“: You can “Pin” the recently used data to “Pin Board”. If you want to copy the text or image again, just simply double-click on it. “Pin Folder & Pin Image“: As an extremely useful software that enables you to keep important data always ready-to-use, you can pin images and folders to the board for future use. This will improve your efficiency greatly and save you time. “Local DataBase“: For your convenience, PinClipBoard will save the image files to the database so you can still use the pinned images even you have deleted or moved the original image files. “Synchronize“: Enable sync service and you can share your clipboard between all computers (Mac/Windows system) and smartphones (iOS/Android) in the same WLAN. Scan the Qr code to get the data easily. Above: An animation from the developer’s site. Above: A screenshot of me putting PinClipBoard to the test. Download and install PinClipBoard for 100% free. Manage your clipboard, pin frequently-used text, images, and folders, scan the Qr code to share the data in your clipboard across all devices in the same WLAN. PinClipBoard now is fully compatible with Window 10/8.1/7/Vista. 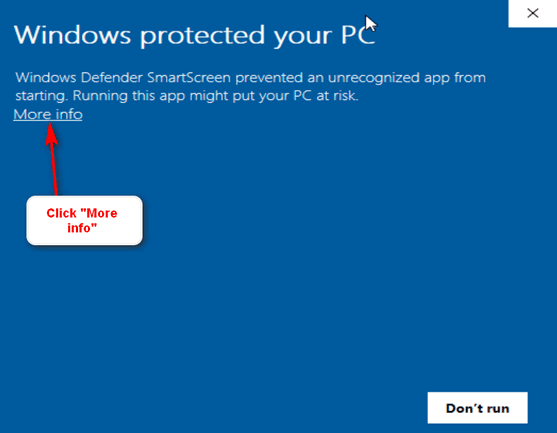 Microsoft SmartScreem is not so smart. It detects this program as dangerous. We tested this program on 3 machines and checked it against 65 antivirus/antimalware programs (including Emsisoft) and all 65 reported that PinClipBoard was free of any problems. We would never recommend anything harmful to and we don’t just trust our own judgment…we trust Emsisoft and we use Virus Total to check all the software we recommend. [Above] Click on “More info” then click “Run anyway”. 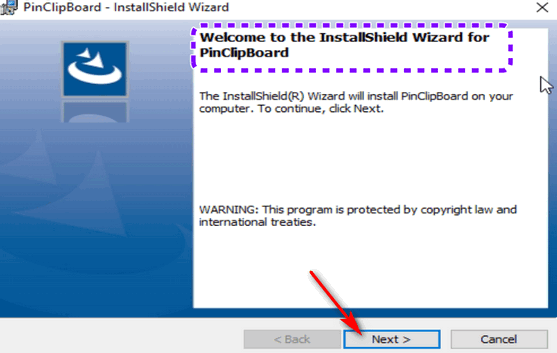 And after you do this, you’ll see PinClipBoard’s installation dialog. Click “Next” to continue with the installation. For no particular reason, this Clip Board manager appealed to so I downloaded it AGAINST the advice of MS and Emisoft. When I tried to activate it to have a play around, I was again assailed by all sorts of dire warnings. So I squibbed it and called in Mr Revo and got rid of the whole kit and caboodle. I wonder if any others had similar problems? #1. Emsisoft does not detect it. #2. 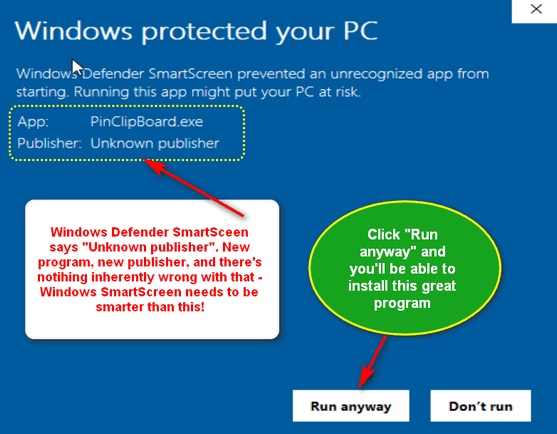 Microsoft SmartScreen is not so smart it defines files as dangerous because they are not well-known or widely downloaded. #3. Just to be sure, we scan all the software we recommend with VirusTotal. VirusTotal scans the program with 65 antivirus/antimalware programs including Emsisoft. Thanks for reminding me to put this information in the post. You can see the results of the VirusTotal Scan here. We would never recommend any software that we didn’t thoroughly test on more than one computer and check with VirusTotal and Emsisoft. Is nobody else having a hard time getting this to “work” like I am? I’ve installed it twice, with the same results. The first time the image of the Clipboard was thru Irfanview and copied nothing. The second time I got nothing on the screen. Am I going to have to go to the manufacturer for help? Virginia… we test software on as many computers as we can test it on. It worked on all of our computers as described. We are not the developer of this software – we are just recommending it. We don’t provide support for every freeware program we test and recommend. If it doesn’t work for you, just remove the program – nothing lost – it cost you nothing. If you want to use it, then write to the developer for assistance. It worked fine on 2 of our Windows 10 computers and our Windows 7 computer. In fact, I’m using it right now this work computer.